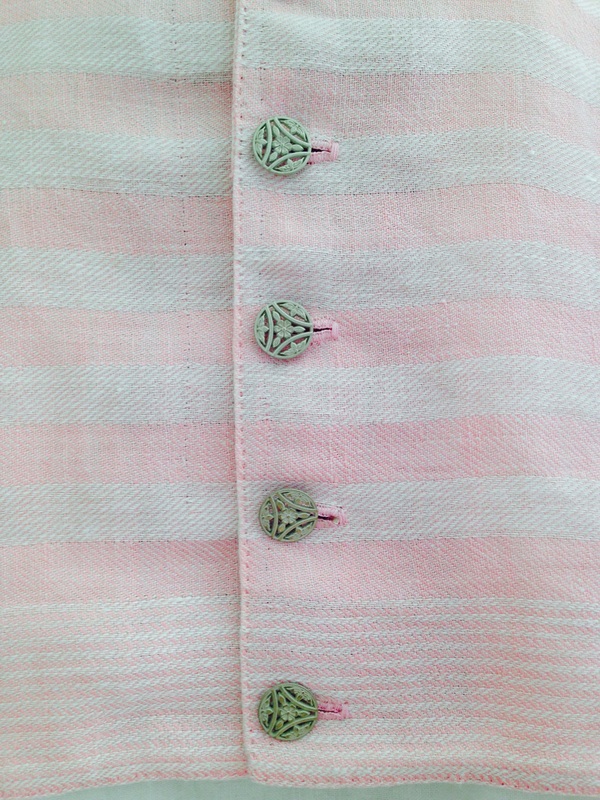 Last weekend I finished the buttonholes and yesterday I sewed on the buttons. 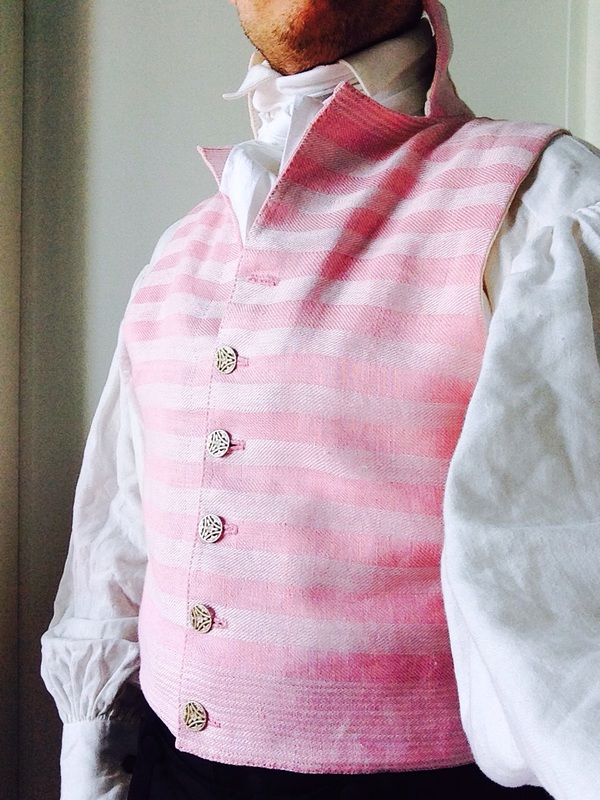 So all work is done, and I got myself a new waistcoat! If you care to read about the process I managed to write five (!) installments for this little project. Click on links here, here, here, here, and here. Getting ready for some quick photos. 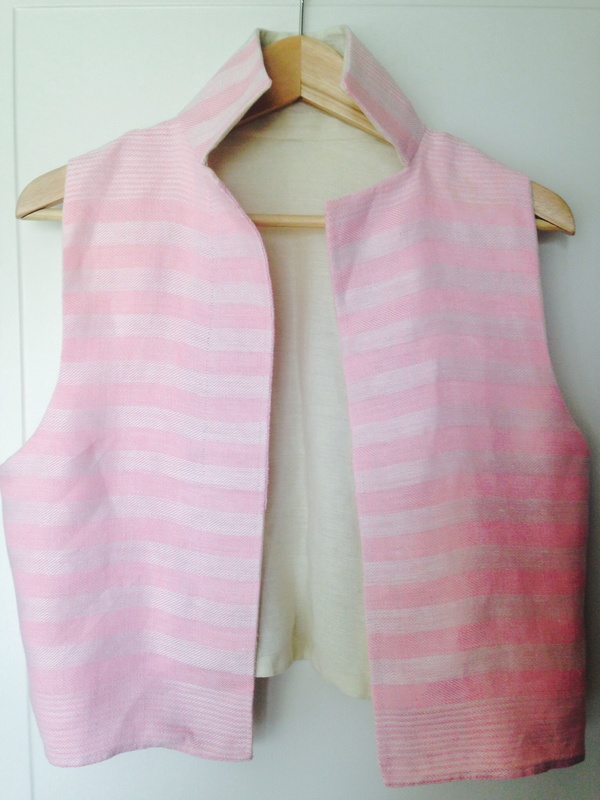 The idea was to make a rather plain and comfortable waistcoat for summer picnics. 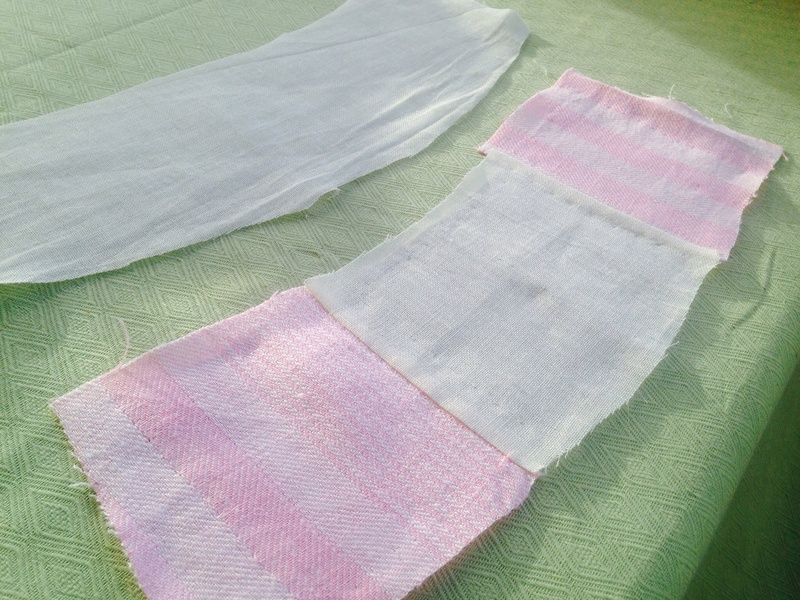 There was just enough of this pink linen for the typical 1790-1820’s style with short waist. Six metal buttons. They are just ordinary modern buttons from the fabric store, but have that suitable neo-classical look. I found the exact match of cotton embroidery thread. I used two strands for the buttonholes and one strand for the prick-stitches. 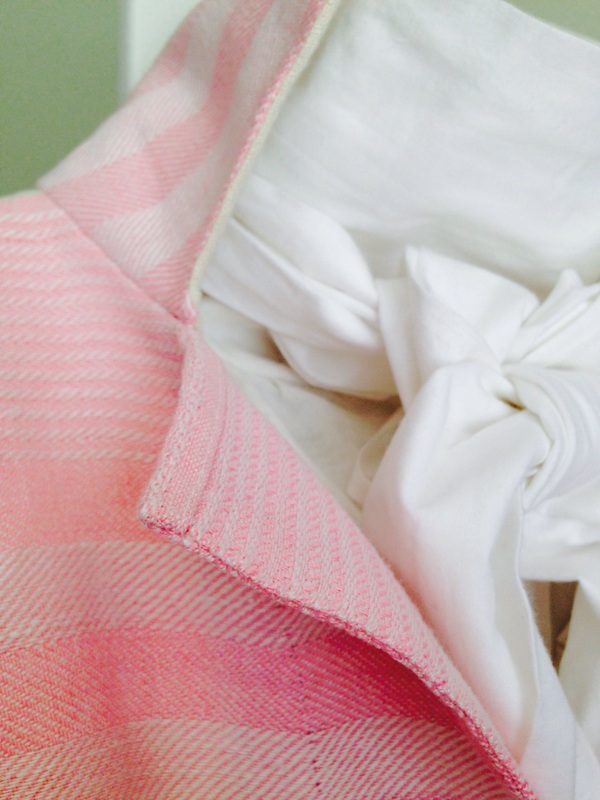 Closeup of collar and lapel. If you are under the impression that I have been lazy, you are (seriously but not entirely) mistaken. 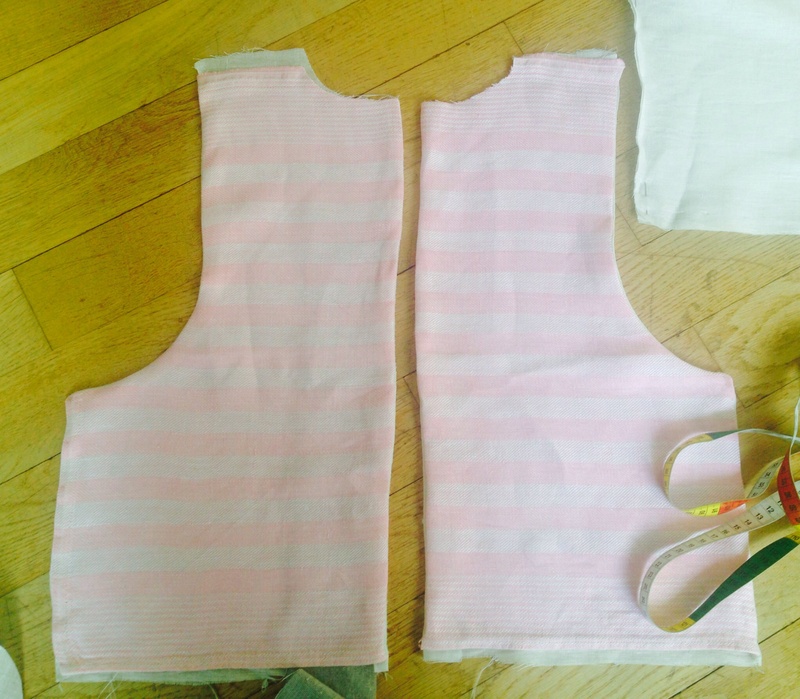 I have spent several hours these last weeks working on the waistcoat, and now I see the light in the tunnel. I promised to be detailed with the construction of the collar, so many photos today. 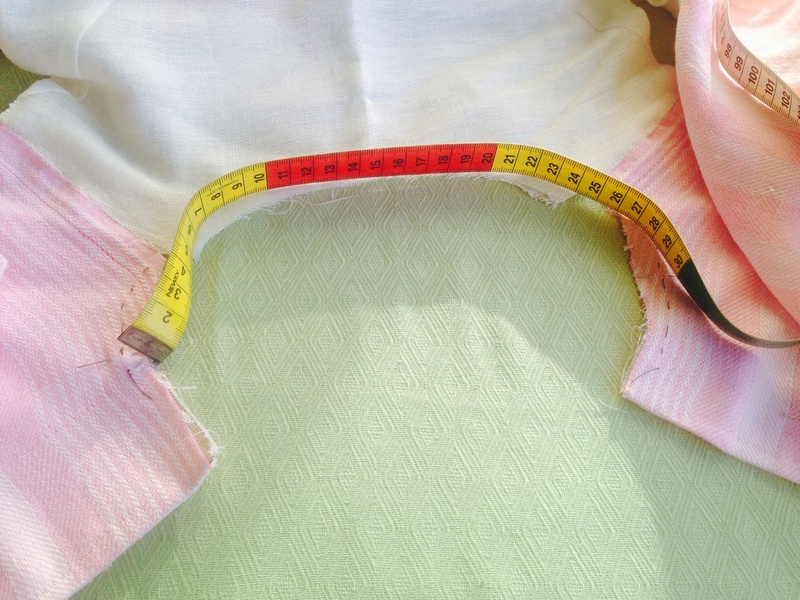 I started by measuring the length of the collar. 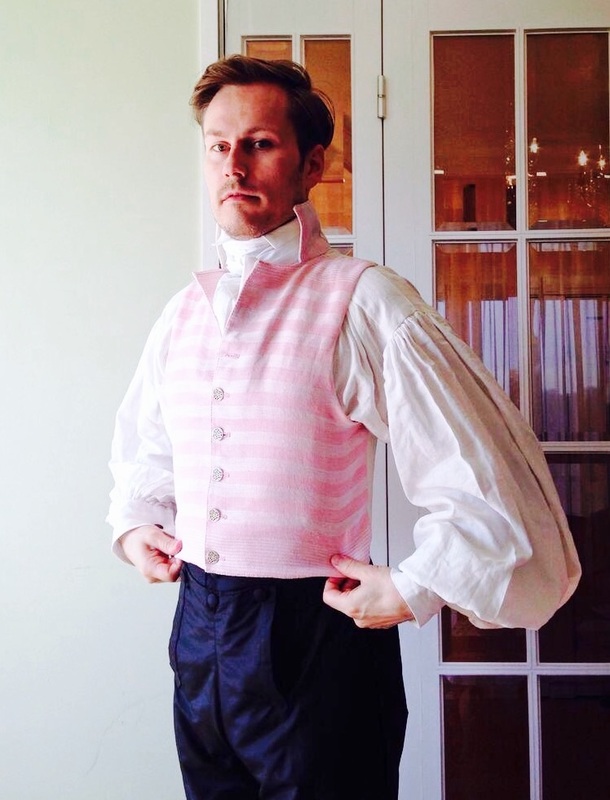 I stood in front of a mirror wearing the waistcoat to decide how far the collar would go. Marked with pins at both ends. Then I cut my collar. 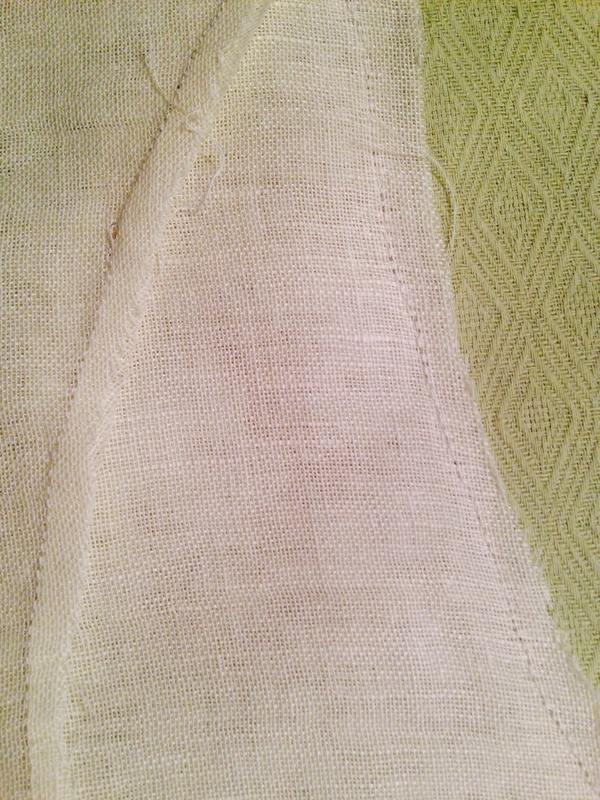 Three pieces (from top): outer fabric, heavy linen for interfacing and linen for lining. 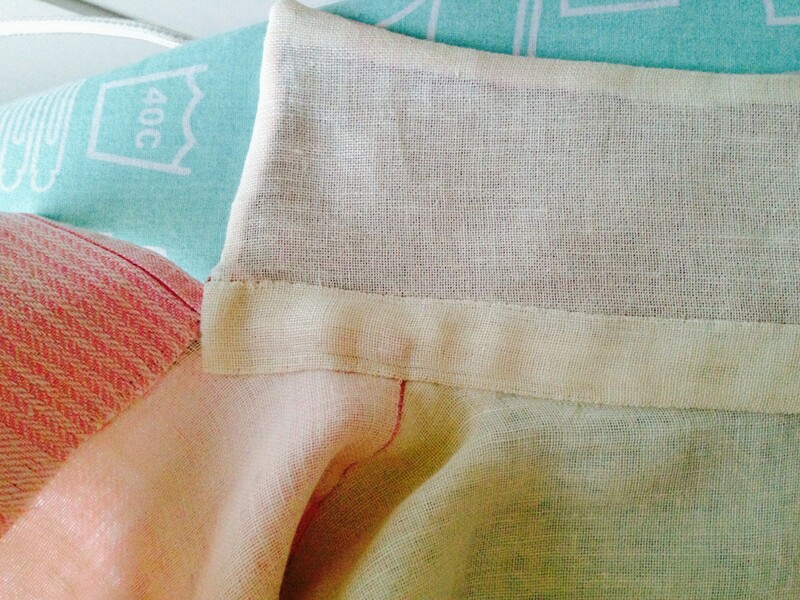 The interfacing is stitched to the outer fabric. 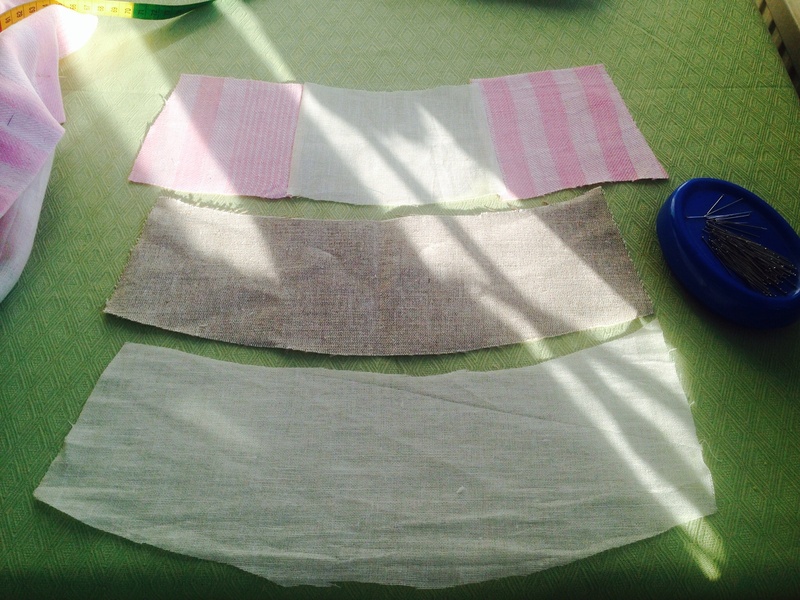 Note that interfacing follows the shape more closely. 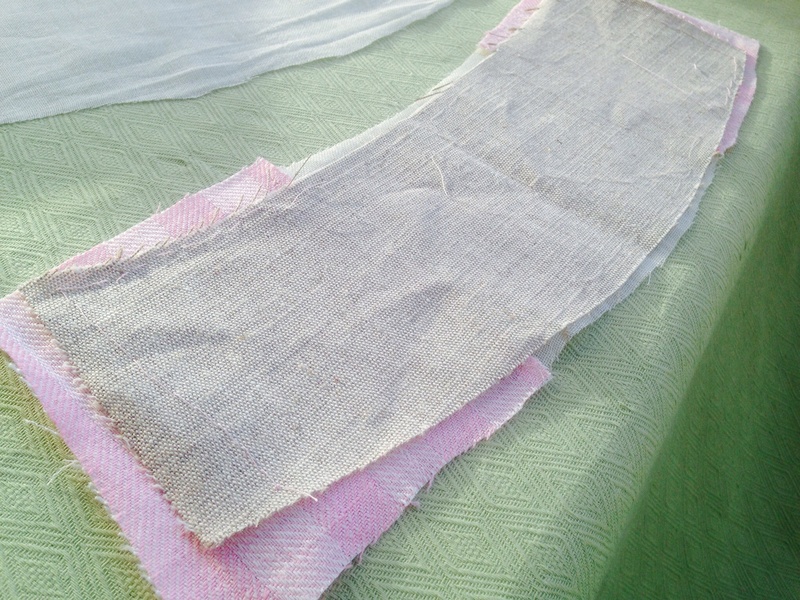 The excess fabric will be trimmed later. Same piece seen from the right side. 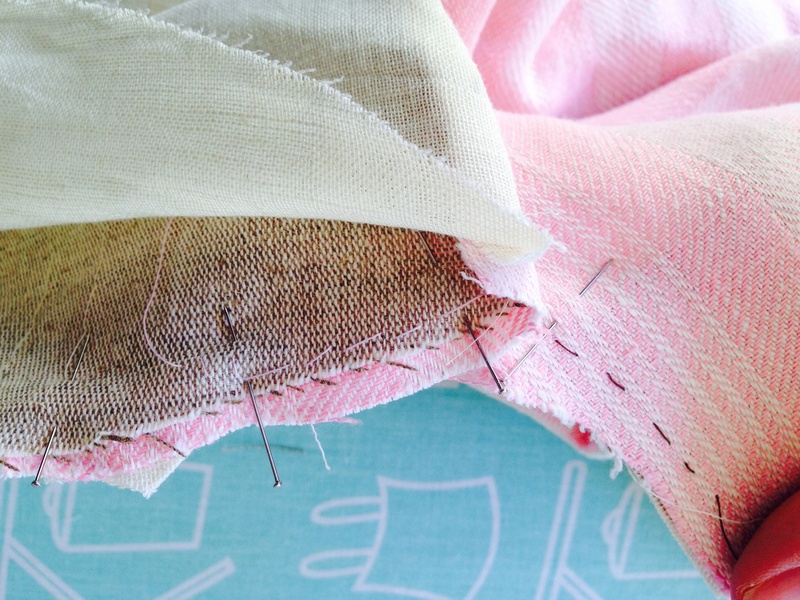 Observe that the outer layer has an inset piece of linen in order to save fabric. This will end up at centre back, and will be hidden beneath the collar of the coat. 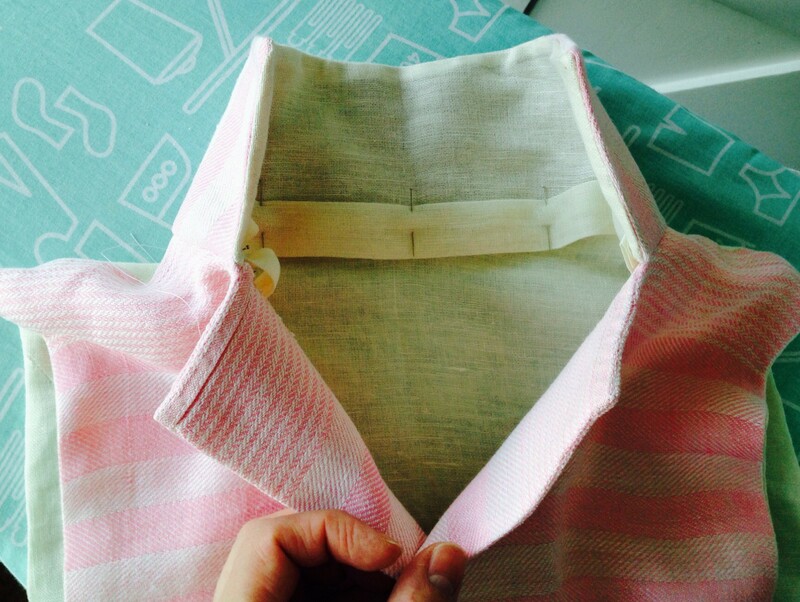 The collar (three layers) is then sewn together on three sides. Seam allowances and corners trimmed, and the entire thing turned right side out. … and up to the marking (the needle) at the front. 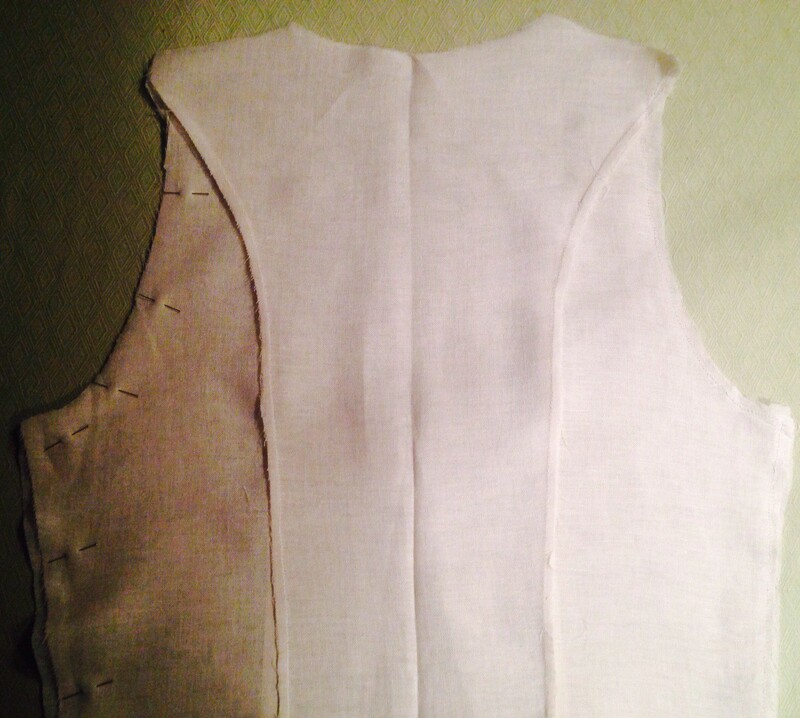 This is after I sewed with a small backstitch through waistcoat and two layers of collar. This is where the collar ends. 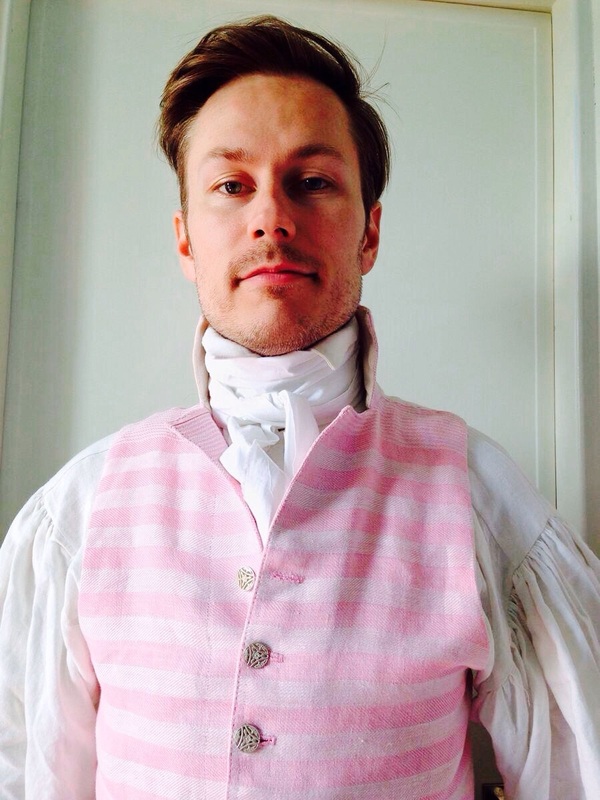 The remaining part of the front forms the lapel. 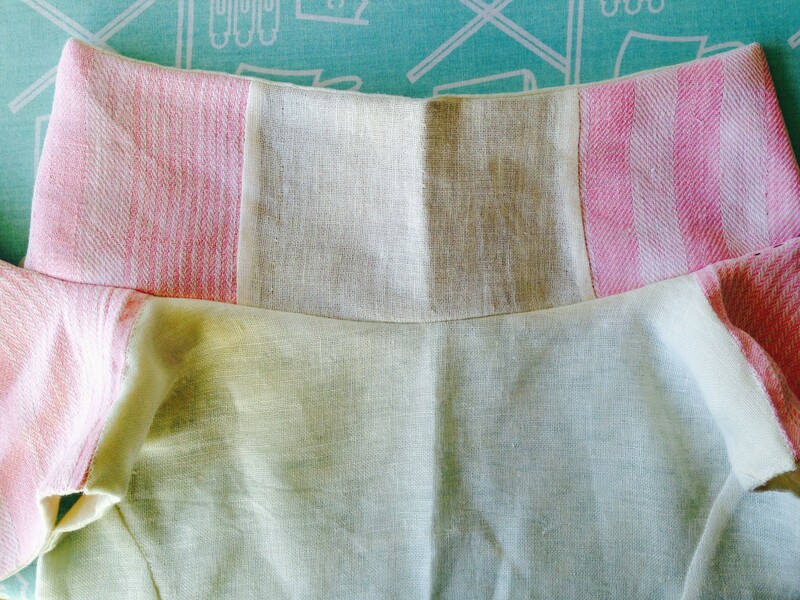 Here it is folded and pinned along same line as collar seam. 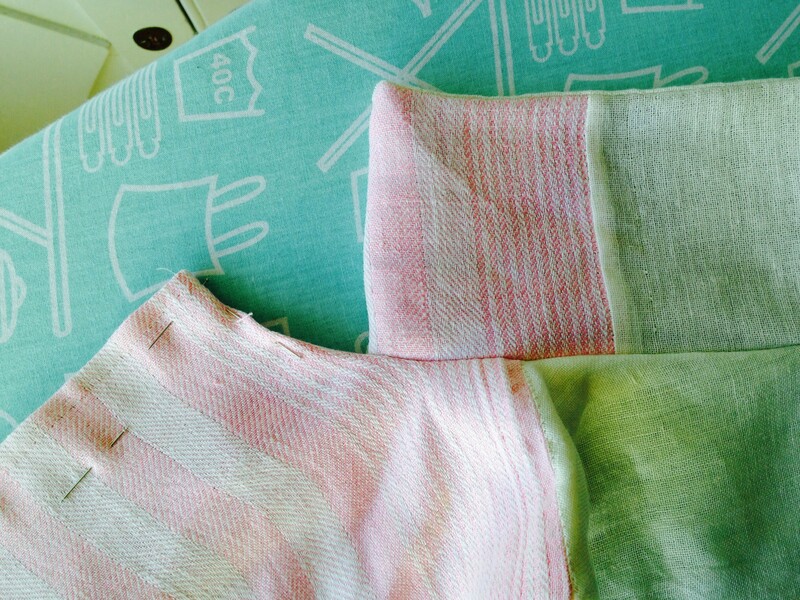 The linen looks very green. And seen from the inside. 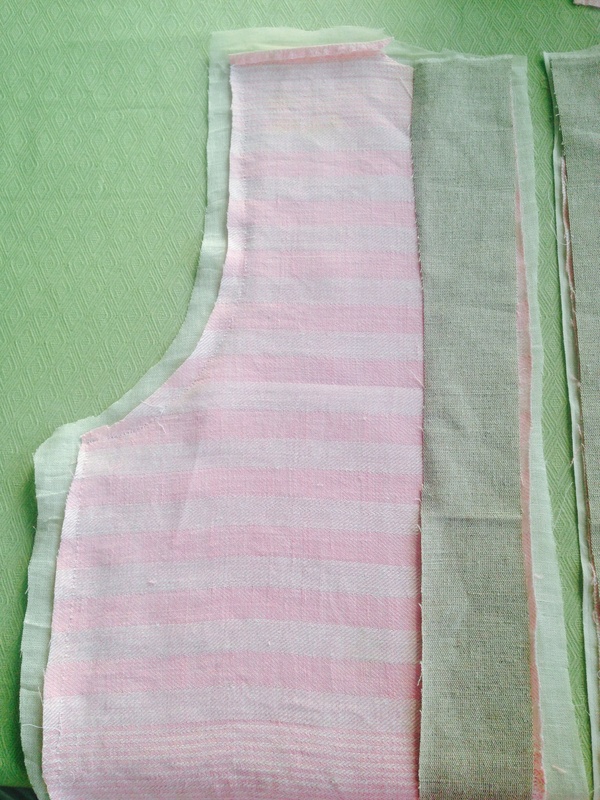 Seam allowance on collar and interfacing pressed upwards. 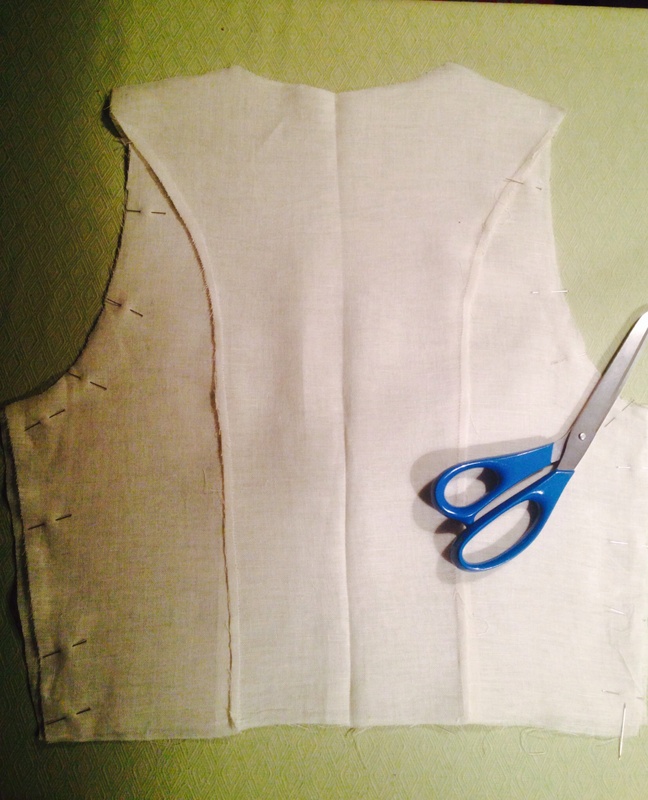 The seam to the right is the shoulder seam. 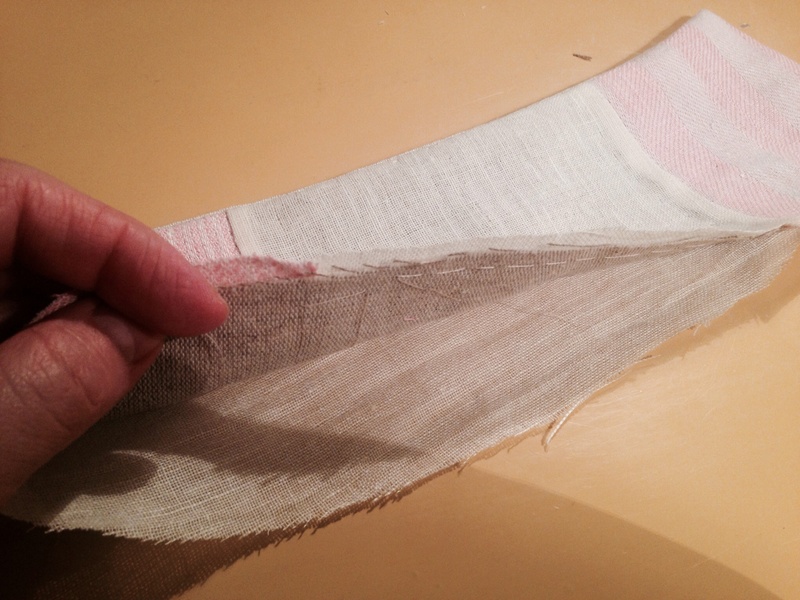 The lining is folded down and pinned, then whip-stitched. Next: Adding facing to the front edges. 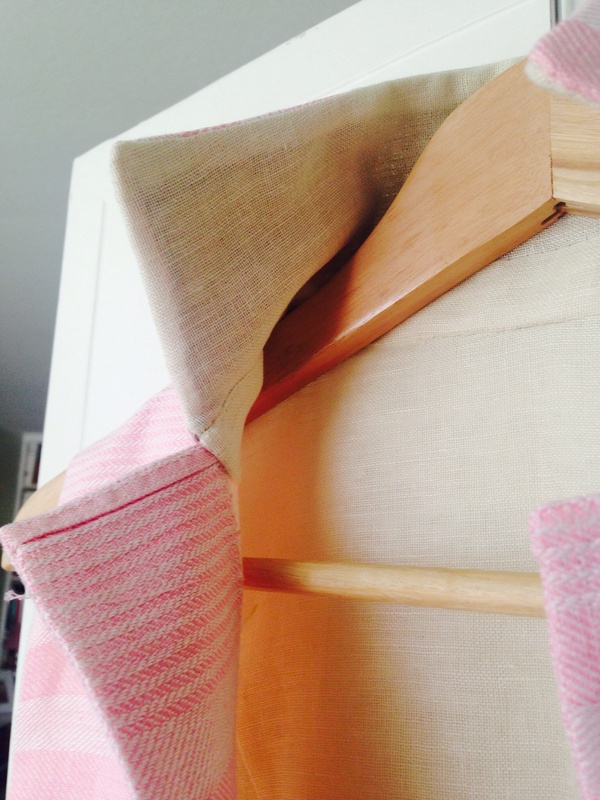 There was just enough pink linen left for this. 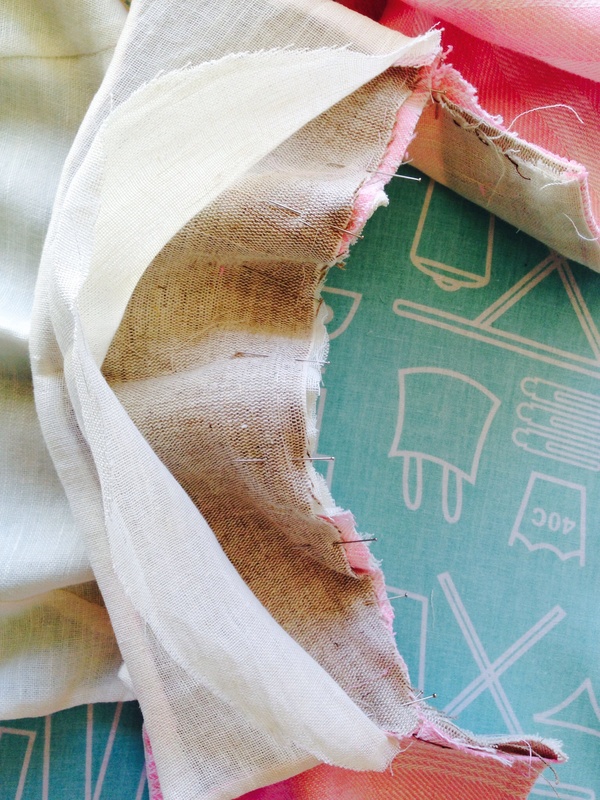 I folded and pressed the front edge and then carefully whipstitched it in place. 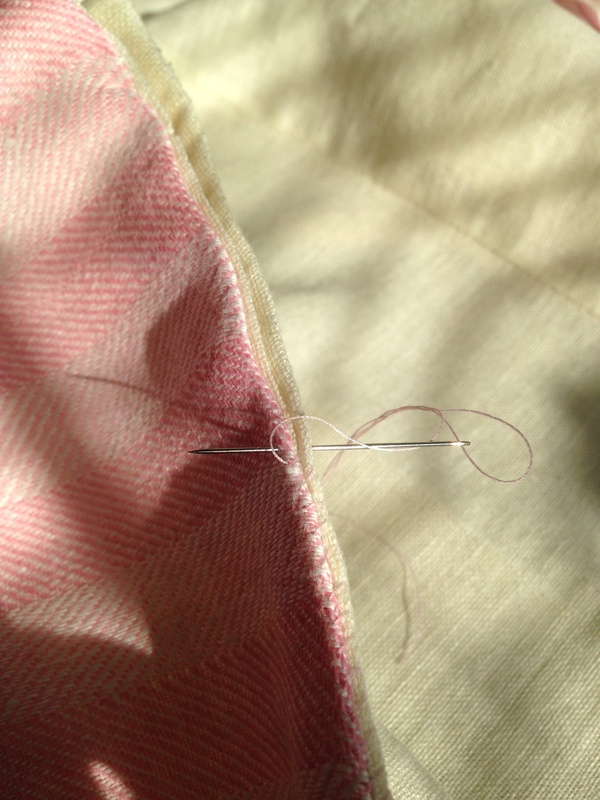 The top of the facing (with original hem) then covers the raw edge of the lapel. 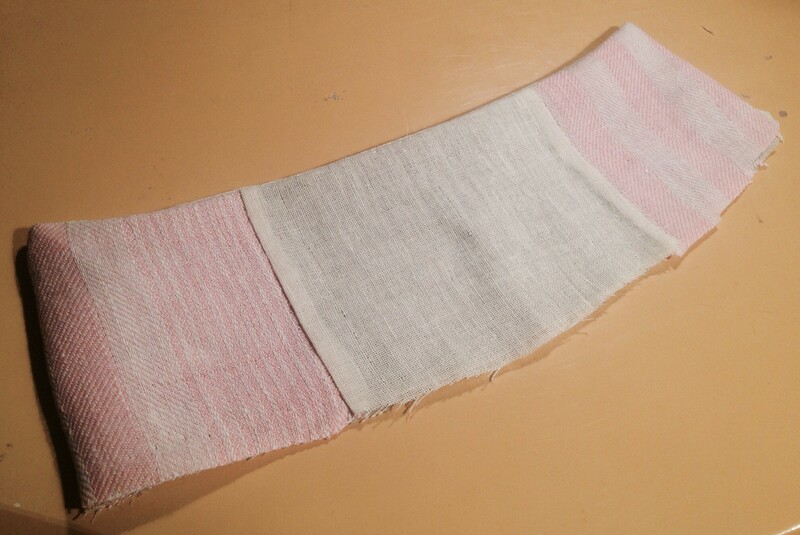 I still thought the inside of the collar a bit messy so I decided to add a strip of linen to cover the seam with the added bonus of giving extra support to the collar. 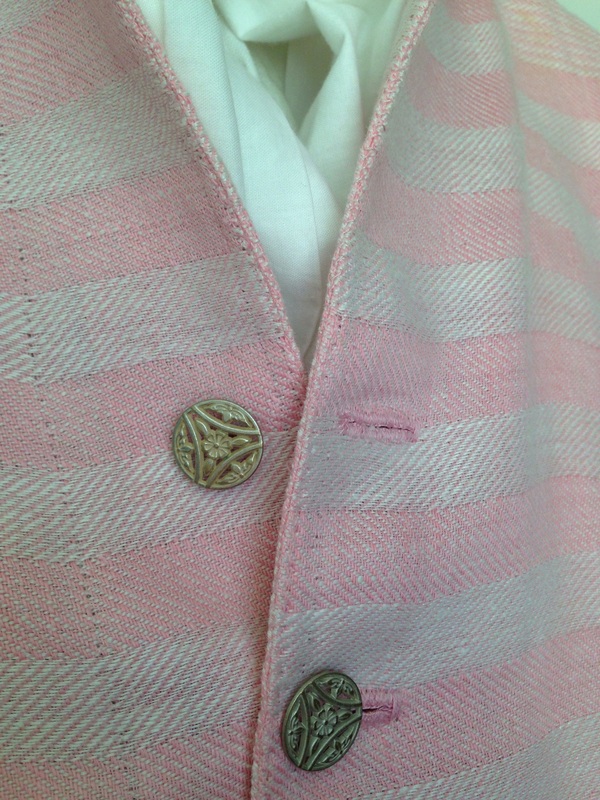 Closeup to show inside of collar and lapel. Almost there! I need to add buttons, buttonholes and prick-stitch all edges. 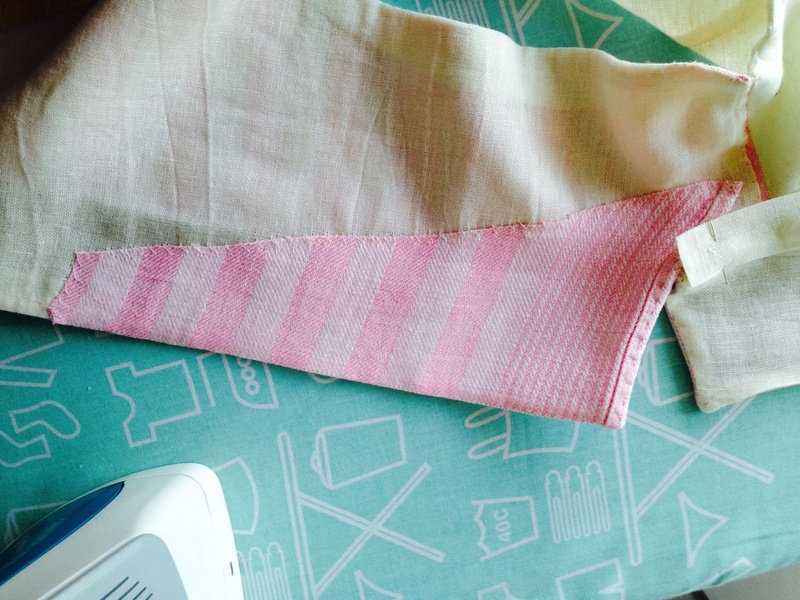 Side seam is done. When laid out flat the stitches work as the spiral in a binder. 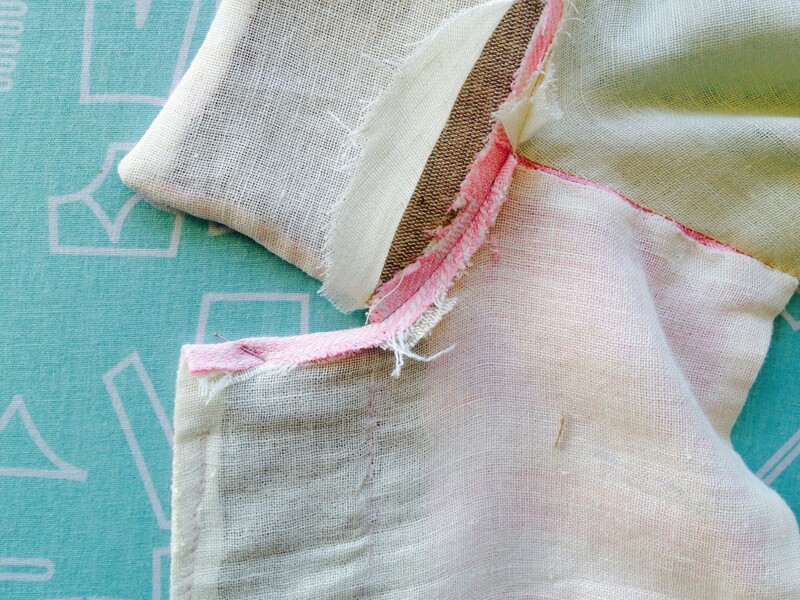 This technique is possible when all pieces have been sewn together separately, outer fabric with lining, right side facing right side, then turned inside out. 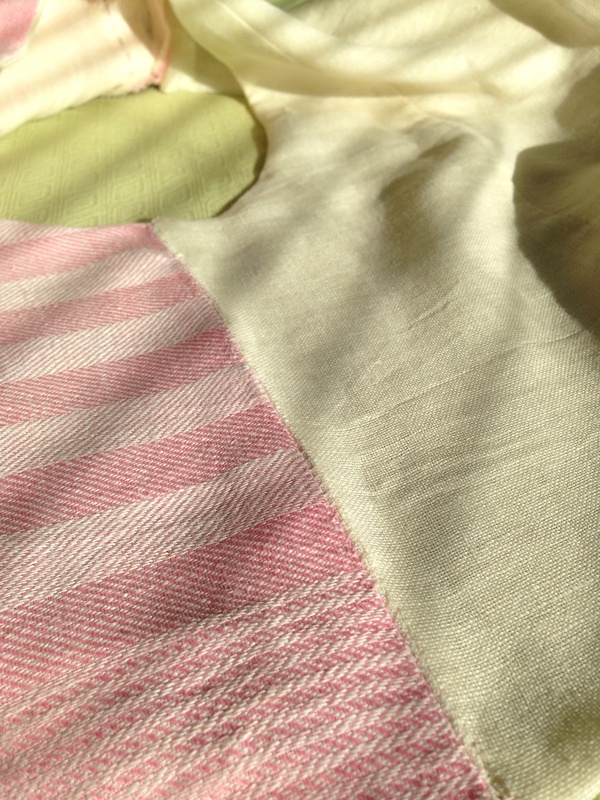 Now you have lined pieces with neat edges since the seam allowance is hidden between the layers. The garment is then assembled in the way I described above. 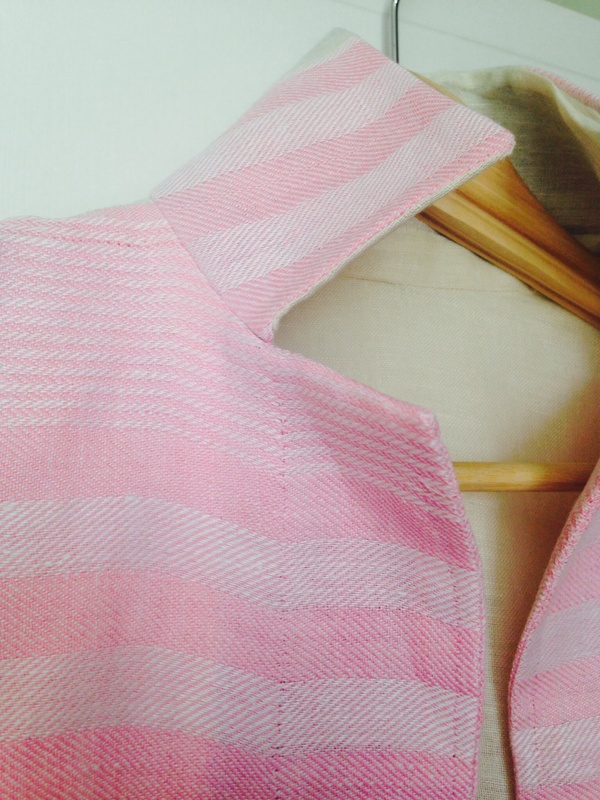 Somewhere online I saw a linen shirt (or shift) done this way, only that the edges were first hemmed and then whip stitched. 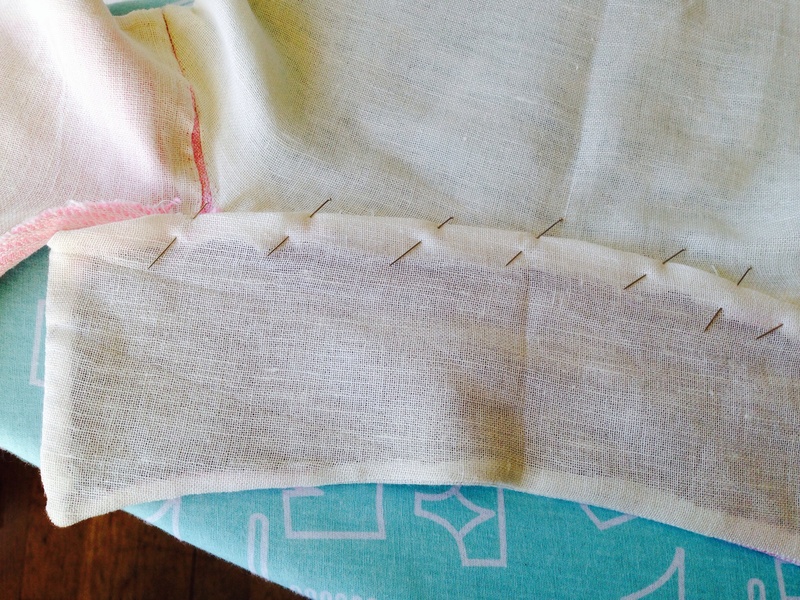 Is perhaps easier than using the backstitch and then binding the seam allowances? Does it make sense? Have you tried this? And if so, did it work?